How much this really has to do with food, I couldn't tell ya. Except the prize is 8lbs. of cheese. Christopher Anderson, 20, was stretchered off wearing a neck brace on a spinal board after hurting his back as he finished head over heels. That's right, he could have been paralyzed for trying to win cheese. This year's winner is Tony Hanks, the local postman. I don't know his medical status. First, the MC counts to four. Then, the guest roller releases the heavy wheel of cheese and it goes flying down the hill. Then, and borrowing the website's own dramatic words, "The competitors hurl themselves [Marni thinks to herself: OMG!! OUCH!] down the slope after the cheese." 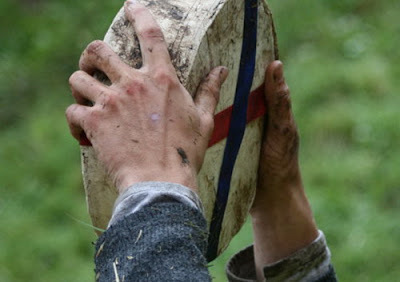 And finally, the cheese is awarded to the first competitor to reach the foot of the hill. Take a look at this rolly-polly video of the event. Hahaha! You are hilarious! Where do you find these things?????? I wonder, do they get the cheese that was flung down the hill or new, undamaged cheese? joyce - where? i don't even have to search! somehow they are magnetically drawn to me.